Wily is no stranger to the pages of Bluesdoodles; in fact I strongly recommend hitting the search facility and checking out his recorded and live history…you will also find E D appears there too. In case that is too taxing, an extract from the review of his last album explains the Wily factor…” Wily Bo Walker (Wily is pronounced the same as the coyote) is from Glasgow and yet has been a little overlooked in his homeland and the rest of the UK. In the US, however, he has not only been recognized but was inducted as Master Blues Artist in the Blues Hall of Fame in 2016. Trying to sum up Wily’s career is difficult due to its scope and I couldn’t think of a better way of putting it than this from his own website …”With a career spanning more than 40 years, Wily Bo works across many styles and genres; Blues, Gospel, Soul, Classic R&B, Jazz, Rock and Americana. A solo artist, songwriter, composer and performer noted for his characterful vocals and swaggering ‘live’ performances: from his huge New York-based ‘blues and soul review’ productions and recording projects to his UK based, New Orleans themed, ’Rattlin’ Bone Theatre Show’, from his solo acoustic swamp ’n’ stomp shows through to his stripped-down 4 piece rockin’ Blues and Americana themed ‘Wily Bo Walker Band’”. E D Brayshaw is harder to get information on; suffice it to say he is a remarkable and accomplished guitar player who has worked with Wily on a number of occasions…check out their collaboration Stone Cold Beautiful for proof, because it is just that and, rumour has it (and fingers crossed) he is about to record his first solo album. Anyway, onto their latest release, and they have put together a double CD that takes you through the great storm of 1996 in ‘Dixie Alley’ in the deep south from the perspective of three main characters, who first appeared on Stone Cold Beautiful. Described as a soundtrack to a film noir, it has two cover versions that fit neatly into the overall narrative constructed by Wily and EDB. The full story is on the CD cover or on Wily’s website or, the best way, by listening to the music and lyrics. Opening with Storm Warning, the quality is apparent straight away with a lovely electric guitar piece before Wily’s gruff and tuneful voice sets the scene for the storyline. It’s a nifty slice of blues-rock and also benefits from another regular contributor to Wily’s work, as Karena K adds backing vocals. The EDB guitar solo is simply and technically brilliant. I Want To Know slows the pace with some stunning guitar phrases over a keyboard backing. The soulful blues is accentuated by the backing vocals and Wily’s vocals actually suit the whole atmosphere; we get another couple of seriously tasty guitar solos too. Hotel Blues is a Loudon Wainwright III song that the guys have beefed up by speeding it up slightly and using the bright tones of an acoustic over simple drums and keys then, in the middle section, the electric guitar cuts in with an understated and fitting solo. Loan Me A Dime is the second cover and is the signature song of the Mississippi born Fenton Robertson. (You may have heard Boz Scaggs version, even if Boz tried to take the credit!). This slow blues-rock classic is preserved and updated really well and not just slotted in to fit the narrative. September Red is gospel-tinged blues…it’s a nice work, with a laid back keyboard solo and another superb, extended guitar solo ameliorating the plodding nature the song was beginning to fall into. Killers On The Run is a bit lightweight with its strummed guitar initially conjuring Eaglesy fluff but it is rescued by a strong vocal that could be a sweetened Lemmy… and that guitar of the redoubtable EDB, especially on the funky outro solo that uses the whole neck and quite a few different techniques to sum up the class that oozes from EDB’s fingers. CD2 opens with Running Wild, which is blues-rock in structure but with an acoustic and electric playing a harmonious phrase before the band (well, EDB is the band!) cut in with the main riff. The vocal is again in keeping with the music and the storyline. Night Of The Hunter is another blues-rock number, but with a Free feeling, even though the guitar is fuller than the trademark Kossoff it still has that latter day Free about it. Tennessee Blues is slower and has more country tinge as it builds via neat picked guitar with some lap steel behind it all. Then we get one of the best of a lot of best solos, as the guitar is played without too many high harmonics but is picked with precision and feel…if this was how all country music sounded, I could be converted…but it isn’t! After The Storm has a AOR anthem feel as the Boston like intro winds it way to a fairly standard slice of rock with the blues still there in the background. The Ballad of Johnny and Louise is a heavy, slow blues-rock with a great riff that appears every time you think it has gone. The choral chorus adds to the overall feel and the subtle keys in the background combined with the solos and the light and shade of the whole thing, makes me wish that DC had listened to this while writing his latest. The title track, The Roads We Ride, comes across a bit like CSNY but, fortunately, builds into a more complex and melodic piece with acoustic developing the melody as the keys add colour. After the halfway lull, the guitar again takes the song to another level with yet more carefully crafted fret work. It all wraps up with the short Storm Warning (Reprise), which is exactly what it is; it takes those melodies and the acoustic strums as a fuzzy slide reprises the main theme…finishing with a flock of birds going mental, it kind of left me wanting more of that slide. I would have liked that to continue, perhaps at the expense of one of the longer tracks…but then that’s just me and my guitar fetish coming to the fore yet again. This is a remarkable work of true blues with a lot of rock thrown in. Frankly, the storyline doesn’t matter that much as all of these work as stand alone tracks and although it surely would make a decent film noir soundtrack, it remains a value packed double album of the blues. The guitar work is exceptional throughout and Wily’s gruffness doesn’t detract from the sentiments and usually compliments them very well. So, if you like your blues with some rock, you’ll love this; the story is interesting, but I rarely have time to listen to a double CD in one sitting and so, as I said, you do not need to always go through them all in order…just let shuffle take you where it chooses and you’ll be served some quality music by two quality musicians. 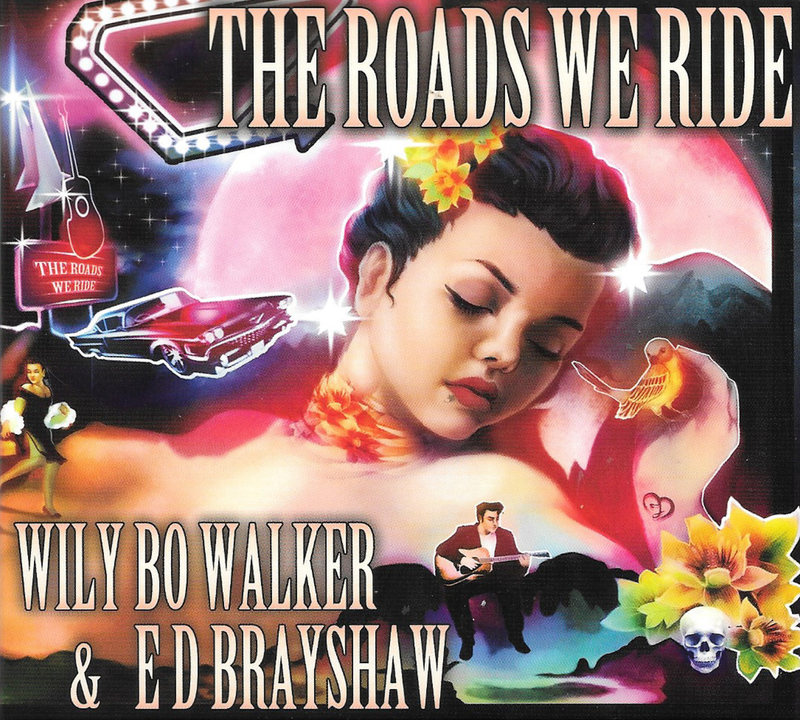 The Roads We Ride production is superb, described as a soundtrack to a film noir, the theme is picked up throughout the wonderful illustration, packaging and accompanying booklet creates the atmosphere that ensures you sit down and relax, listen and enjoy this superb album.